Restoration Robotics the global leader in robotic hair restoration, today announced that Dr. Paul Rose, MD of the Miami Hair and Skin Institute will present on the ARTAS iX™ Robotic Hair Restoration System at the South Beach Symposium in Miami, Florida, on Saturday, February 9th, 2019. Dr. Rose recently purchased an ARTAS iX System at his leading practice in Miami. The ARTAS iX Robotic Hair Restoration System provides the only solution utilizing machine-based vision, machine learning, and artificial intelligence to offer precise, minimally-invasive, repeatable harvesting and implantation functionality in one compact platform. The Miami Hair and Skin Institute specializes in hair transplant procedures. Procedures are performed exclusively by world-renowned Hair Restoration Surgeons & Dermatologists, Dr. Bernard Nusbaum, MD, Dr. Paul Rose, MD, and Dr. Aaron Nusbaum, MD. 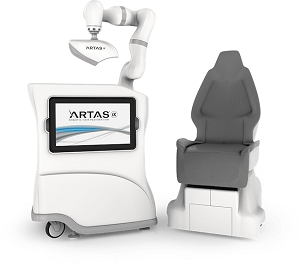 Ryan Rhodes, President and Chief Executive Officer of Restoration Robotics, commented, “We are very excited to have The Miami Hair and Skin Institute install a second ARTAS System in their practice to meet the growing demand in their market. The ARTAS® Robotic Hair Restoration System is the first and only hair restoration system in the world combining robotic and artificial intelligence technology designed to assist surgeons through the most significant and tedious stages of the hair restoration process. It provides the ultimate advanced and comprehensive offering for precise, efficient, and repeatable hair restoration and automates the most significant aspects of hair transplantation procedures: graft harvesting, recipient site making, and now, implantation. ARTAS iX™ is equipped with a 3D-camera stereoscopic vision system with improved 44-micron resolution and a 7-axis robot arm to deliver unmatched procedural analysis, precision, repeatability, and clinical workflow efficiency. Restoration Robotics, Inc. is a medical device company developing and commercializing the ARTAS® and ARTAS iX™ Robotic Hair Restoration System. The ARTAS iX System is the first and only physician-assisted system to dissect and assist in the harvesting of follicular units directly from the scalp, create recipient implant sites using proprietary algorithms and implant the hair follicles into the designated sites. The Company has unique expertise in machine vision, image guidance, visual servoing and robotics, as well as developing intuitive interfaces to manage these technologies.